Up-selling is one of the sales techniques that has been in use for many years in various industries, including restaurant marketing. 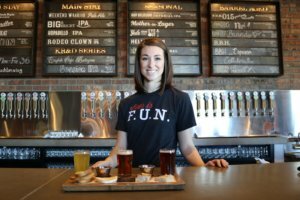 Activities that aim to increase the final bill of restaurant customers consist of testing their needs and attempting to suggest a more expensive item on the menu. See our 7 tips for how to increase the effectiveness of up-selling in your restaurant. 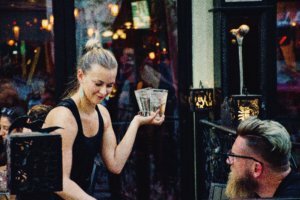 The nature of up-selling is also the reason why waiters have the obligation to handle it correctly. Waiters communicate directly with customers; they suggest meals, take orders, clarify any doubts, serve food, and finally, collect the payment. What do you think the effects of an up-selling campaign would be if the waiter is not familiar with all the items on the menu? Explain to your employees what up-selling is and show them which items it applies to. Give them tips on how to suggest dishes and beverages to customers so that they are more willing to order them. Observe them while they are working and control whether they fulfil the assigned duty. This will help you increase effectiveness of their activities in restaurant marketing. In order for up-selling to work, waiters must know which items it covers. But this is not all. The right moment to make the offer is also important. If up-selling applies to snacks, instruct your waiters to offer them before appetisers. If you want to improve sales of your chef’s special cake, offer it to your guests ordering coffee. Contact with your waiters in this case is very important. More than likely, you’ve been convinced by telemarketers before to buy products you didn’t really need. Do you remember how irritated you were? Your restaurant customers often feel the same way when waiters have no skills for suggesting products covered by up-selling. Every waiter should remember that their task is to help customers in choosing the ideal meal. The conversation should start with finding out the needs and assessing whether the customers is interested in a product at all. If they indicated that they are not interested, it is a clear sign that the waiter should not try to convince them. One method for effecting positive results from up-selling is to link several items in the menu. Try to describe an expensive dry wine from your menu as something that goes well with red meat. have your waiters suggest a glass of such a wine with orders. 5. Take out is also important! Customers are amazed by your cuisine but won’t manage to eat dessert? Suggest they take-out through the online food ordering system. That way, they can enjoy something sweet to finish off their meal at home. As a show of appreciation for a good meal, you can expect positive feedback about your offer left in the UpMenu system. The feedback and review system is an important element for restaurant marketing. 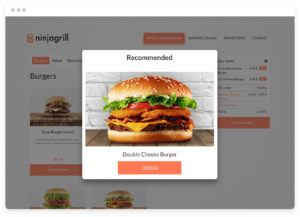 The UpMenu application enables customers to order food remotely and you to recommend particular meals in the menu through pop-ups that appear once they access the menu. Customers visit your restaurant to spend quality time with a delicious meal and relaxing beverage. You cannot allow them to feel like just the goal of a restaurant marketing strategy. Trying strongly to convince customers to choose expensive items on the menu is a sure way to lose them for good. If you notice that a customer is irritated by up-selling, stop. Don’t overdo things by offering too many special deals and reduced prices. Don’t make the price become the only criterion for choosing your restaurant. Read more about restaurant marketingin our article 5 restaurant marketing strategies to benefit from lone customers.